Note from Howard: As you probably know, I have been recommending vinegar for a long time for several uses. In addition to the horticulture and agriculture uses, there seems to be some important health benefits for animals and people. Apple cider vinegar might cure more ailments than any other folk remedy. Vinegar apparently provides at least some cures for allergies (including pet, food and environmental), sinus infections, acne, high cholesterol, flu, chronic fatigue, Candida, acid reflux, sore throats, contact dermatitis, arthritis, gout and the list goes on. 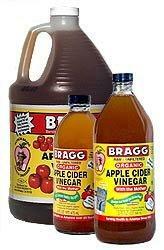 Apple cider vinegar also helps breaks down fat and is widely used to lose weight. It has also been reported that a daily dose of apple cider vinegar either straight or in water helps control high blood pressure. It also brings a healthy, rosy glow to the complexion and can cure rough scaly skin. Apple cider vinegar is also wonderful for animals, including dogs, cats and horses. It helps with arthritic conditions, controls fleas, repels flies, and gives a beautiful shine to their coats. After grooming sessions, use a few drops in dogs’ ears after cleaning them to avoid ear infections. Fleas, flies, ticks and bacteria, external parasites, ring worm, fungus, staphylococcus, streptococcus, pneumococcus, mange, etc. are unlikely to inhabit a dog whose system is acidic inside and out. Should you ever experience any of these with your dog, bathe with a nice gentle herbal shampoo - one that you would use on your own hair - rinse thoroughly with vinegar, and then sponge on apple cider vinegar diluted with equal amounts of warm water. Allow your dog to drip dry. It is not necessary to use harsh chemicals for minor flea infestations. All fleas drown in soapy water and the apple cider vinegar rinse makes the skin too acidic for a re-infestation. If you are worried about picking up fleas when you take your dog away from home, keep some apple cider vinegar in a spray bottle, and spray your dog before you leave home and when you get back. For raw spots caused by excessive licking, use a few drops in water, and sponge the affected areas with apple cider vinegar. Apple cider vinegar can help cure a sore throat. Use 3 tbsp. of apple cider vinegar, 3 tbsp. lemon juice, 2 tbsp. of honey and 16 oz. water, and warm to sipping temperature and sip. Adding juice from chopped ginger can be used for more power. We use various kinds of vinegar for various solutions. Let’s keep adding to the list. Please send me your uses and how it helps you.